Indian Council of Agriculture Research conducted the All India Entrance Examination for Admission for Undergraduate, Postgraduate and PhD courses on 18th & 19th August. According to the re-exam schedule, ICAR AIEEA result 2018 was to be declared on 30th August but, a Kerala High Court order on 21st August had stayed the result publication for three weeks as reported by NDTV. So, students appear for the examination would be able to check out scores soon. Earlier, the ICAR’s 23rd online examinations for UG, PG and PhD courses were organised on 22nd and 23rd June. But, on 12th July, Indian Council of Agricultural Research published a notice for the cancellation of examination. AIEEA exam was to be conducted again, but what would be dates was notified with another notice issued on 24th July. “ICAR to re-conduct the examination in offline mode (OMR Based) on the 18th and 19th August at 56 examination city centres all over the country”, stated in the notice. The counselling schedule will be issued later by the administration. 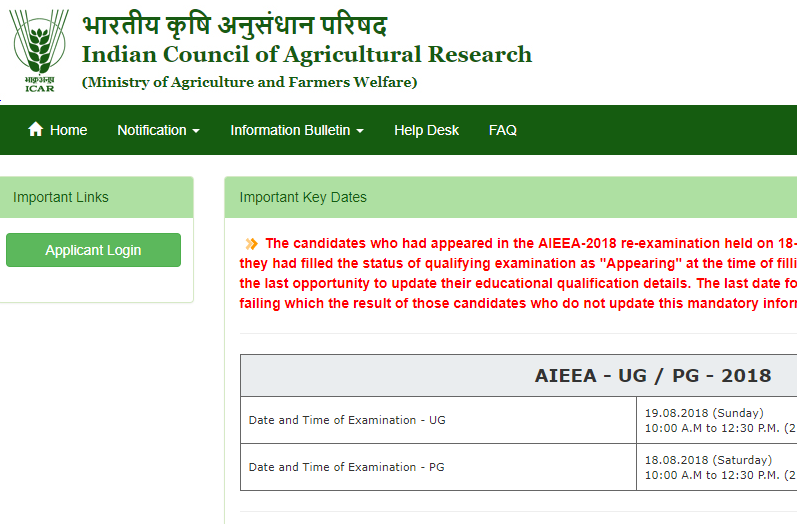 ICAR AIEEA result 2018 would be issued in terms of overall merit-rank and category rank acquired by the candidates. Students should stay updated by visiting the official website regularly. As per the information provided on the official website, candidates who had filled the status of qualifying examination as “appearing” at the time of online application form submission were given an opportunity to update the qualification details on or before 26th August. The result of those candidates who have not updated the details within the given period may not be declared. ICAR will declare the results online and the link would be activated on https://icar.org.in/. Candidate will have to visit this website first. 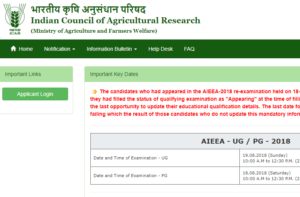 On the home page, they have to press the link “AIEEA- UG/ PG/ PhD – 2018 re-examination”. Then, students will be redirected to another URL – https://icarexam.net/. There, the administration would provide the link once the result is declared. Candidates can check the previous year ranks (with cut offs) at which admission was given in various courses of AIEEA UG/ PG/ SRF. For More Updates, Stay Connected With ALL INDIA ROUNDUP.